It’s simple. If you use hot water at home to wash your clothes, heating the water is the single largest expense of running a load of laundry. I base this on the numbers calculated by Mr. Electricity on the cost of washing machines, using a set of rather rigorous data. If you wash on hot and rinse on warm, you’re going to use an average of 4.5 kWh per load, which at a cost of $0.15 per kWh will cost you $0.68. On the other hand, if you wash on cold and rinse on cold, you’re going to use an average of 0.3 kWh per load, which at a cost of $0.15 per kWh will cost you $0.04. The numbers are clear: if you wash on hot, you’re dumping water down the drain. Of course, there are a lot of counter-arguments for this. The chief argument for using hot water is that hot water is the best route for getting your clothes as clean as possible. The high temperature of the water is most likely to kill bacteria and also to cause more movement of the water, causing more soiling and germs to be removed from the clothes. However, hot water also does the most damage to clothes, causing them to shrink, wrinkle, and fade more than other temperatures. I would only use hot water if the clothes are seriously soiled for some reason. For example, I’ll use hot water for a load of cloth diapers or, in my own recent experience, towels that were used to clean up a bathroom in which a four year old girl attempted to flush most of a roll of toilet paper at once. Most of the time, our clothes simply aren’t dirty enough to warrant the rough treatment that a hot water washing would give them. What about warm water? It’s the middle of the road choice. I tend to use it on our children’s clothes, as they tend to accumulate food stains and warm water removes them well. I’ll also use it on any adult clothes that became sweaty or particularly soiled due to the day’s activities. 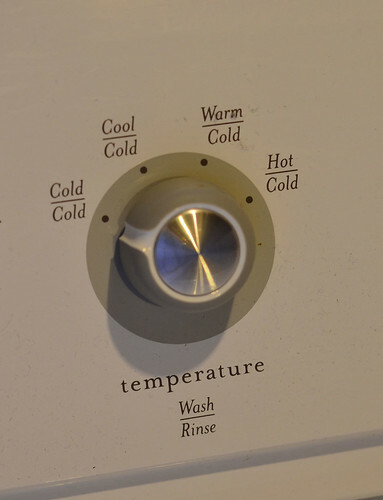 If you’re interested, washing your clothes on warm and rinsing on warm will cost you $0.53 per load, and washing your clothes on warm and rinsing on cold will cost you $0.29 per load. Still, most of my clothes are washed in cold water. Most days, my non-workout clothes never get very dirty at all. They accumulate a bit of dried skin flakes (as everyone’s clothes do), but so does the carpet in a house and I don’t bathe the carpet in hot water to remove those flakes. Cold water easily removes such particulate matter and the soap leaves the clothes quite clean. Another factor: cold water washing is also the gentlest choice for your clothes, extending their life. There’s less garment wear on a cold water washing as well as fewer wrinkles (meaning less ironing) and less shrinkage. All of these factors extend the life of your garments, meaning you don’t have to go clothes shopping as often, saving yourself even more money. What about the rinse cycle? I can’t see a good reason to rinse your clothes in warm water. Your clothes are already clean at that point – the rinse merely removes any excess soap that still happens to be in there. Using cold water instead of warm for the rinse cycle will save you $0.15 per load. I advocate using cold/cold for washing and rinsing most non-soiled clothing. When clothing is moderately soiled (with sweat or food, for example), I’ll use warm/cold for a load. I use hot water only for things like cloth diapers or items that have come in extensive contact with bodily fluids. Assuming that our household runs an average of one load a day, one warm load a week, and one hot load every three weeks (which is about our average), rinsing everything on cold, we would spend $34.06 in energy costs per year. On the other hand, if we ran our daily load with a hot wash and a warm rinse, we would spend $248.20 in energy costs per year. Running mostly cold washes with all cold rinses saves us $214 per year. That’s a savings worth writing home about.